With one signature along the dotted line the Penguins were able to significantly upgrade their lineup, while at the same time putting a dent into the roster of one of their chief rivals in the Atlantic Division, by signing free agent defenseman Paul Martin to a five-year contract on Thursday. Martin, 29, comes to Pittsburgh after spending his entire six-year career with the New Jersey Devils. Martin became the second high-profile free-agent defenseman to sign with the Penguins on the opening day of free agency, following former Phoenix Coyotes defenseman Zbynek Michalek, who inked a five-year deal earlier on Thursday. Much like Michalek, Martin likes the strength the Penguins have built on defense. While it was tough for Martin to leave a good situation in New Jersey, where the team had won four division titles and made six playoff appearances during his six years with the team, Martin found it enticing to join a Penguins team which still has a majority of the core remaining from its 2009 Stanley Cup championship team and plays in front of the top fan base in the National Hockey League. Whereas Michalek will offer the Penguins a defensive, shutdown presence, Martin is more of a two-way defender capable of chipping in both offensively and defensively. The 6-foot-1, 200-pound blueliner has scored 30 or more points in three of his five full NHL seasons while posting a plus-55 rating in 400 career games. The Minneapolis, Minnesota native projected to have his best offensive numbers this past season, but a broken forearm limited him to just 22 games. Martin first fractured his left forearm blocking a shot against the Penguins at Mellon Arena on Oct. 24, then suffered a setback in December when he had to have surgery after it was determined the bone wasn’t healing properly. Unfortunately the injury, which sidelined Martin for 59 games, caused him to withdraw from the United States Olympic Team. However, once Martin returned – ironically against the Penguins on March 17 in New Jersey – he came back with a bang. Martin scored that night against Pittsburgh and finished the year with two goals, nine points and a plus-nine rating in 13 games to close out the season. Martin believes his strong finish proved he has fully recovered from his forearm injury and provides a glimpse to Penguins fans as to what he will provide Pittsburgh throughout the next five years. Martin is expected to see time on the point with the Penguins alongside youngsters Kris Letang and Alex Goligoski. 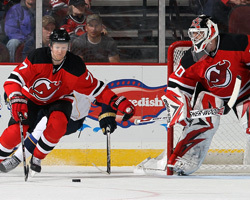 The left-handed shooting Martin has experience with such a role after seeing plenty of minutes serving as the power-play quarterback at times for the Devils. Two years ago Martin recorded 18 (2G-16A) of his 33 points on the man-advantage. He hopes to see those numbers increase with the Penguins as he lines up with the likes of Sidney Crosby, Evgeni Malkin and Co. after trying to contain those guys for so many years.